Eero Saarinen lead a life of design – from sculptor, to architect to furniture designer. Beginning a very young age under his father’s tutelage, Saarinen became one of America’s foremost architects in the ten years following World War II. 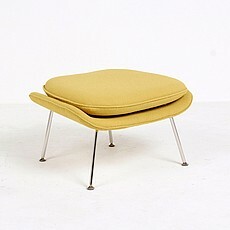 Despite his successes as an architect, Saarinen did not promote himself as a furniture designer. His furniture designs were almost always the result of a creative exercise separate from his architecture. Generally working alone, Saarinen made the sketches, built the scale models and worked through the creative intent of each design in his own space. 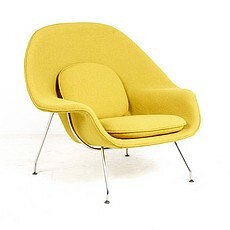 In 1940 Saarinen and Charles Eames took part and won the "Organic design in Home Furnishings" competition mounted by the Museum of Modern Art in New York. While Eames continued to work on molded furniture in plywood in California, Saarinen stayed in Washington DC during the war to continue experimenting with other organic shapes for chairs using new technologies involving fiber-reinforced resins made of plastic. 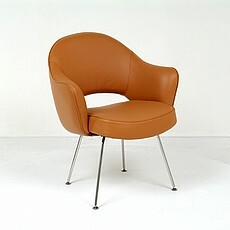 After the War and up to 1950, Saarinen developed the Model 70 Series, which included the Model 70 (womb chair), the Model 71 (armchair) and the Model 72 (side chair). Near the end of the decade, he completed his work on the Pedestal series. 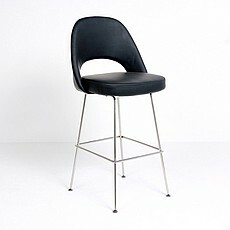 Dimensions (in): 40.5w x 38d x 37h; Seat Interior: 25w x 20d; Seat Height: 15h. Dimensions (in): 25.5w x 22d x 14h; Seat Interior: 21w x 22d; Seat Height: 14h. 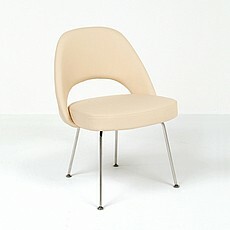 Dimensions (in): 22w x 21d x 30.5h; Seat Interior: 20w x 18d; Seat Height: 18.5h. Dimensions (in): 26w x 24d x 32.5h; Seat Interior: 18w x 20d; Seat Height: 18.5h. Dimensions (in): 22w x 20d x 44.5h; Seat Interior: 20w x 18d; Seat Height: 30h.